Whichever way you like to look at it, there’s definitely some sort of confusion between bread and cake. Banana bread is a similar source of confusion, for me at least. Lacking in yeast, made with eggs, butter and baking powder, the only similarity I can see between this sweet treat and bread is the tin in which it’s baked. Making it as a loaf certainly provides the perfect excuse to eat banana bread for breakfast or slather a slice in butter, but for my money the combination of so many sweet, delicious ingredients is best enjoyed as a dessert. Having recently made a very virtuous banana bread (cake? ), it felt like time to ramp up the indulgence and bake something a little richer, stickier and firmly planted in the world of desserts. Rather than slices I wanted squares, studded with chocolate – which works so wonderfully with banana – and full of flavour from dark brown sugar and nutty browned butter. 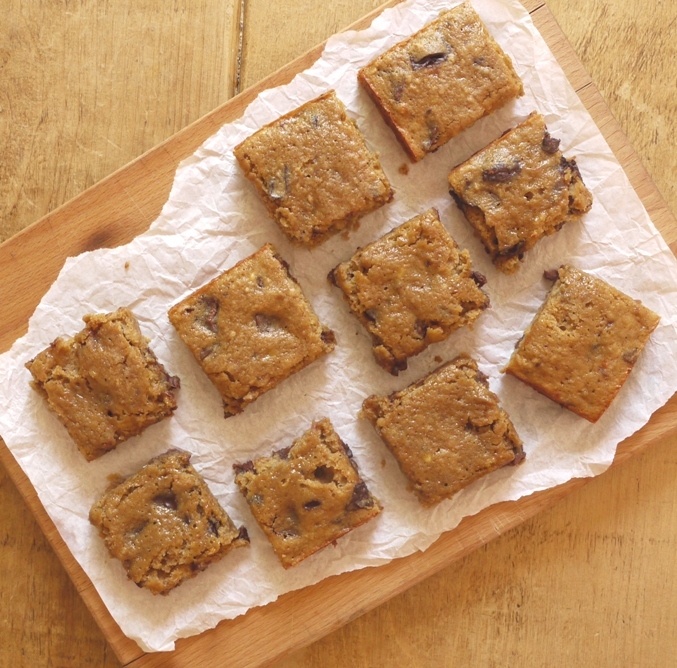 Squidgy and sweet, each of these squares provides a hit of caramel-like banana bliss. I served them with peanut butter ice cream, hence the lack of any extra nuts, but a handful of walnuts or pecans would make a lovely addition otherwise. I used a mixture of milk and dark chocolate at Carnivorous Fiancé’s request, but again do mix it up – lots of people love white chocolate and banana in a blondie and while these are a little more cakey than fudgy, that combination would work well here too if you’re someone with a slightly sweeter tooth. Preheat the oven to 175 degrees C. Grease and line a 23cm square baking tin. Melt the butter in a small pan over a medium heat. Continue cooking until the milk solids begin to caramelize and the butter is nutty and brown, taking care not to burn it. Set aside to cool. In a medium bowl, whisk together the sugar and egg. Whisk in the cooled butter followed by the mashed banana, yoghurt, vanilla and salt. Sift the flour and baking powder in a separate bowl then fold into the banana batter, followed by the chocolate chunks. Pour into your prepared tin and bake for 18 – 20 minutes until the top is set and a skewer comes out clean. Leave to cool on a wire rack then remove from the tin and slice into 16 squares. Delicious with ice cream, eaten on their own or even enjoyed at breakfast. It is a bread, after all . . . I love banana bread (and it’s definitely one of my favourite ‘breads’ for breakfast although I agree that ‘bread’ is a slight misnomer), whether with added chocolate or nuts, frosted with cream-cheese frosting, you name it! And I am all for brown butter – it makes everything taste so much more decadent without actually changing the ingredients! Isn’t brown butter just heavenly? I love the nutty flavour it adds here, especially as I didn’t include any nuts! OMG these look insane! They remind me of Dan Lepard’s banana and brazil nut blondies from Short & Sweet – if you haven’t tried them yet YOU NEED TO. So dense and fudgy and gooey. These look somewhat healthier and even more gooey and delicious, if that’s even possible! Great idea. Thanks Elly. 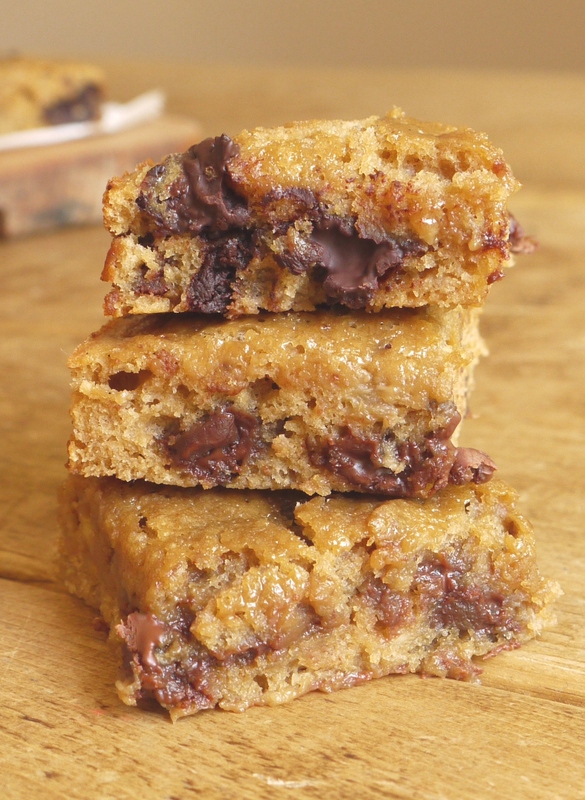 You know, I’ve never made Dan’s blondies as I thought they looked a bit too sweet…but fudgy and gooey is exactly what I love so I may have to give them a go! This flavour combination sounds so, so good! I’ve never made banana bread in a ‘square’ type form before. 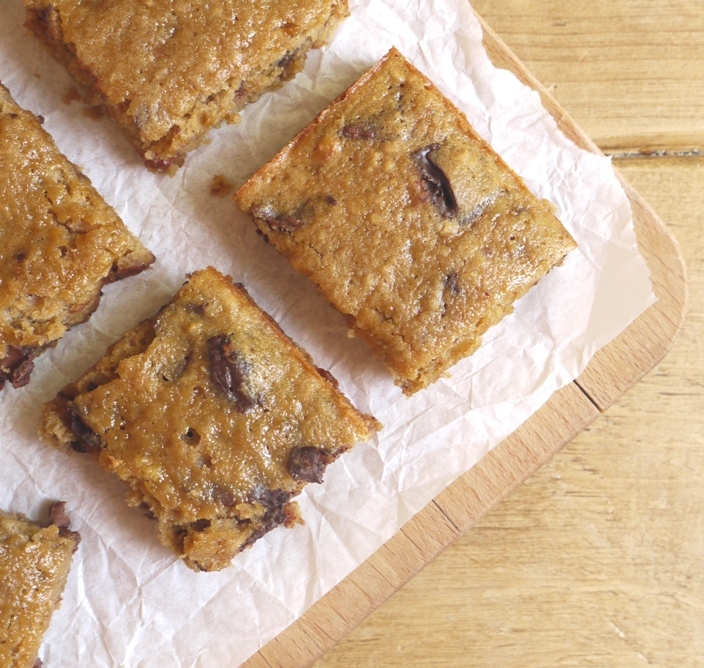 Great idea to get both a banana bread and a fudgy blondie in one hit! Love the idea of the peanut butter ice cream also. Dessert bliss 🙂 Thanks for the gorgeous recipe! I just like that I can pretend that banana bread is healthy and eat it for breakfast, as a snack, etc. :-) Love this brown butter version! I’ve no doubt a few squares of the delicious bread together with one of your wild rice, count and mango bowls would make the finest Bank Holiday brunch in the sunshine! Love the idea of these for dessert especially served with some peanut butter ice cream! Banana bread (cake) w/ brown butter sounds delicious right now! I’m about to buy a bag of bananas just so I can make this in a couple weeks when they’re speckled enough. I’ve found that it doesn’t make a huge amount of difference whether they’re slightly soft or really black and mushy – one day I need to compare side to side and see the difference! Somehow the line between bread and cake for me is drawn in how rustic/low maintenance the treat is. No doubt banana bread has as much sugar and fat as regular cake, but somehow the laziness of it and the desire to eat it at all times of the day make it, for me, a bread. Or maybe I just want to justify eating more. 😉 These squares look amazing! I love how you used both greek yogurt and butter — I think the combination of them make banana bread extra good and squidgy. I love banana bakes and this looks amazing! brown butter and chocolate and banana, excuse me while I wipe my drool! 🙂 I am bookmarking to try! Oh wow, these look amazing! I adore banana bread, but this is really stepping things up a bit. I’d definitely love one of these for dessert…and breakfast and lunch too! Banana bread is one of my favourites too, such a gorgeous sweet, caramel flavour. I always have ripe bananas in the freezer, and this looks so yummy–what a great afternoon treat or dessert! I would definitely call it a cake, but perhaps the original version was less sweet, thus making it more akin to a bread? Who knows… This version is definitely a dessert, one I wouldn’t mind right now! These look amazing! I always seem to read your blog on a dreary rainy day and then ended up making some little bit if deliciousness. Roasted white choc and the maple banana bread are favourites, thank you! Ah, glad to bring a bit of sunshine into your life on such a grey day. Honestly, it feels like November today! These look deliciously gooey and decadent. Definitely in the dessert category and really browned butter is the best thing ever. Gorgeous! I´ve yet to try brown butter with bananas. Wow, this sounds amazing Kate! Just the thing to have with my afternoon coffee. And yes, I am never pleased to call a cake, bread. Brown butter? Yes please! This looks absolutely delish! Thanks for sharing the recipe! It looks VERY delicious! I love how food can bring back memories, for me banana bread was the first thing my mother taught me to bake so many happy memories 🙂 Love the choc chip addition! first of all, i love that you used the word squidgy. 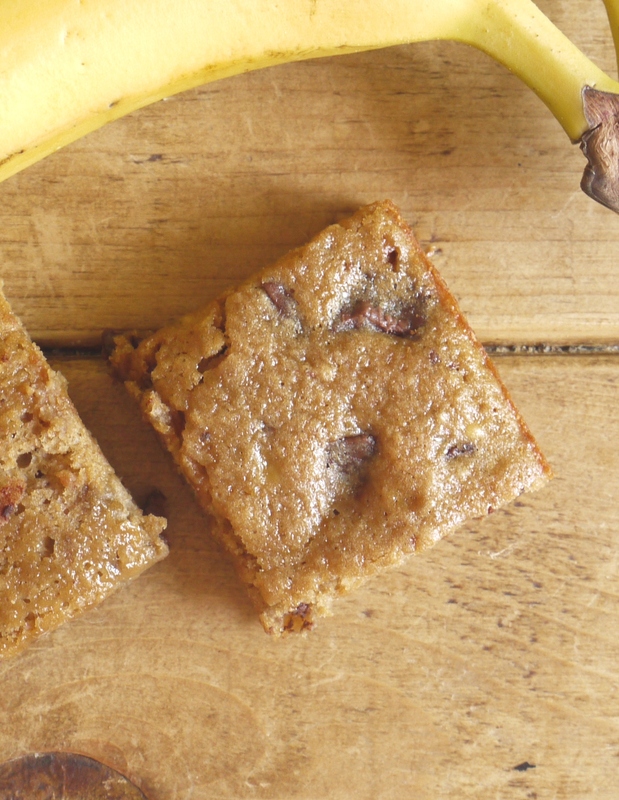 i love these banana bread squares! could you imagine these with butter pecan ice cream on top?! YUM!!! Thank you for the debate and the historical perspective. And the gorgeous photos. Chocolate and banana is a wonderful combination, and brown butter would give it an added dimension of richness and depth. I am imagining it served with the breath of the oven still upon it, and some ice cream melting into a soft pool by its side. Thank you. yes please. u had me at browned butter. Oh….these look tantalizingly delicious!!! SO glad to found your wonderful bolg with your divine inspirations. oh my! 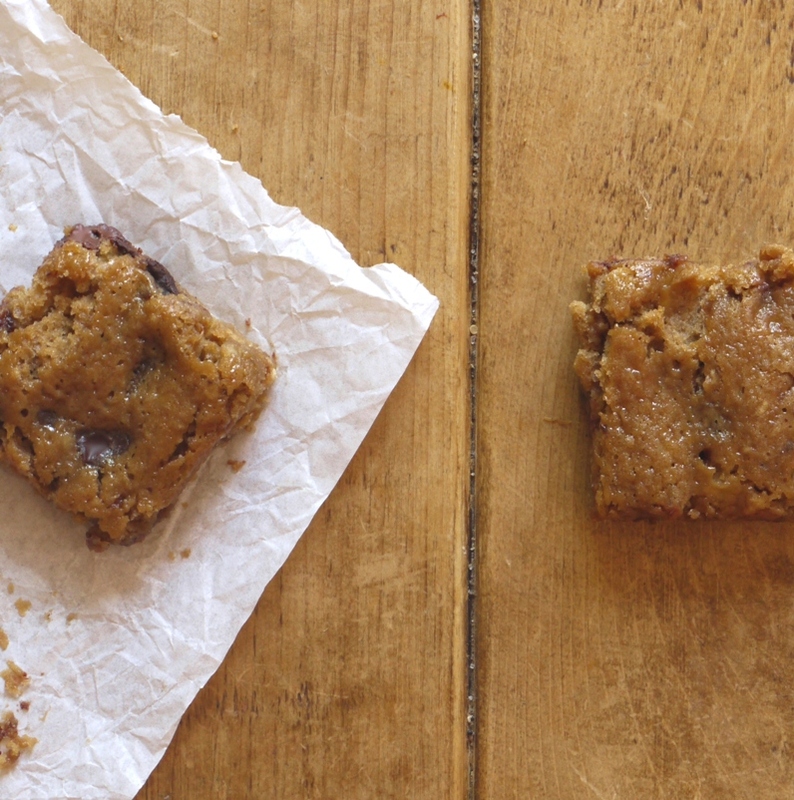 That photo of the squares with the squidgy chocolate….sigh! I finally got round to make these and they were absolutely amazing!! I’m still getting compliments about it now a few weeks down the line! I’ve added a link back to your blog from mine and credit for the recipe.Thanks again! What an amazing recipe! I’ve made it twice already – second time for a friend with a gluten allergy, so I substituted flour with 100g of almond flour and 30g of buckwheat flour, it was so moist and delicious! Thank you!